With more of a global focus on greener technology, our Electric range of has the lowest total cost of ownership using the latest innovative industry-leading technologies. 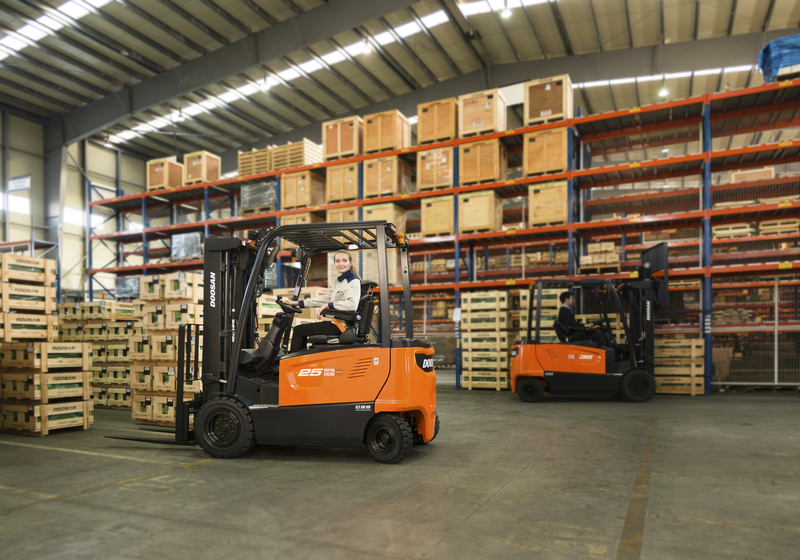 The new 7 Series of 3 and 4 wheel electric counterbalance forklift trucks, continue to follow the core Doosan tradition of delivering simple, powerful performance, whilst most of all, delivering the best possible value for our customers. The specially designed ergonomic operator compartment keeps the operator in complete control at all times, improving productivity and reducing stress and fatigue. The new model offers improved visibility and the latest design in ergonomic hydraulic controls. Thanks to an improved durable design and an additional stability system, Doosan’s new 7 Series electric trucks exceed the highest demands for safe operation. Extended maintenance intervals and advanced technology components reduce the overall cost of maintenance. The latest in AC control systems provide an unbeatable combination of power, performance and reliability. Each parameter is fully adjustable to perfectly match every your individual requirement, providing maximum control and accuracy for every function. How does battery changing work? Can electric trucks work outside?